Who does not love to walk in the light of the sunset in the afternoon? But the mechanics and the pollution have completely diminished the scenery. There is no place in Dhaka city where people can breathe clean air. About 33 million people die every year in the world due to air pollution. About 75 per cent of these deaths are due to heart attacks and the remaining 25 per cent for pulmonary diseases. Air pollution levels are highest in Asia. India is at the top of the pollution chart, and Bangladesh has taken over the next position. According to a report from the Health Effects Institute, there are 1,220,400 people dying in Bangladesh annually due to air pollution. Pollution, from the brick kilns is spreading around Dhaka city. There are more than 4,500 brick kilns around Dhaka. As a result, the air becomes full with pollutants. According to the Department of Environment, brick kilns causes 58 per cent of air pollution in Dhaka (2017). Modern world is using concrete, aluminum sheets, plastics, steel and metal materials for the construction of multi-storied buildings while Bangladesh is depending on bricks for construction.These bricks are made from the soil which is an important element of nature, and in most cases, it is taken from the agricultural land. The brick kiln owners force farmer to dig the fertile soil from the upper layer which is very important for cultivation. In Bangladesh, the brick factory owners usually choose time for making bricks from October to March. There are about 12,000 brick-making companies in Bangladesh. 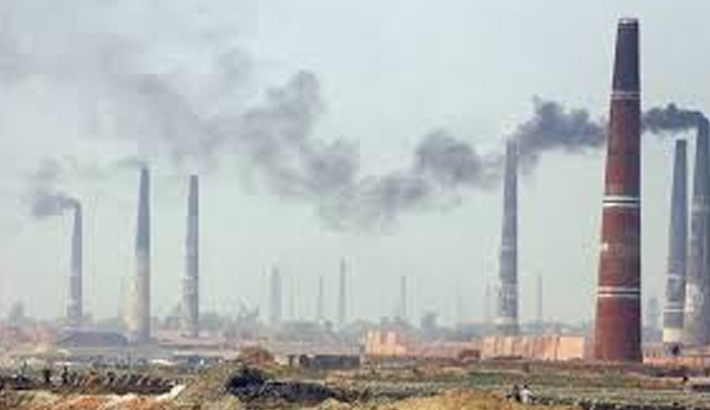 Most of the brick kilns are working in the dry season when the amount of pollution is also high. Generally, half a million ton of clay is required to make one million bricks which come from the fertile soil or topsoil. The topsoil has all the ingredients needed for the crop nourishment and it takes hundreds of years to replenish. Although burning wood is legally prohibited yet wood, charcoal, fuel oil and even used tires are burned in brick kilns. Again, to burn one million bricks nearly 20 tons of coal is required. In our country, tree plantation is a kind of social movement, but we are not getting any benefit due to huge burning of woods from the forest. Burning wood and coal produce dust, carbon monoxide, sulfur and nitrogen oxides which pollute the atmosphere. Due to dust and high level of pollution, nearby trees get killed and vision of eye sights decrease. Law: Notwithstanding anything contained in the law, without obtaining a license from the District Administrator no person can make bricks in brick field. License will not be required in the preparation for concrete compressed block bricks. No person can dig or collect soil from pond, canal, beel, inlet, dighi, river, haor-baor, grazing or fallen areas to prepare bricks. Punishment: If any person makes bricks without obtaining a license from the district administrator of the district of brick field, then s/he shall be punished with imprisonment not more than one year or with fine which may extend to one lakh taka or both. If a person uses soil from farmland, hill, pond, canal, beel, inlet or dighi, river or haor-baor as raw material to prepare bricks without the permission from the appropriate authorities s/he shall be punished with imprisonment not less than two years or with fine which may extend to two lakh taka or with both. Mitigation Plan: The Department of Environment and the district administration will identify the drum brick kilns and they are immediately liable to monitor these in the field level. It is urgent to bring the relevant people under the law and take proper steps, in addition to cancelling the license of those who are continuing their work even on the areas banned by the government. Those using wood as a fuel should be given maximum punishment. Besides it is necessary to take the environmental compensation from the brick field, which is not yet converted into 120 feet in height. To reduce the pollution in brickfields, the use of advanced equipment is compulsory, and if it is strictly enforced by law, it will significantly contribute to reduce the pollution. With this, the time has to be fixed for the conversion of the old inefficient bull’s trench kiln into Hoffman’s kiln. In this case, training or cost-effective manuals can be arranged for the construction and management of Hoffman system with government subsidy. In order to establish a new brick field, old and inefficient bull’s trench method should be banned. If bricks are to be exported, then it should be produced in environmental friendly way and setting a fair price for the environmental friendly manufacturing process. Besides, instead of burning bricks in fire, it is necessary to create and initiate sand-lime bricks.